The term earnings refers to the amount of profit produced by a company during a specific period (typically in quarters). It consists of revenues minus operating expenses, cost of sales, and taxes over a specified period. It is one of the main components for calculating the price per share. The term comes from the root word ‘earn.’ To earn means to get payment for work. When profits do not meet experts’ estimates, the company’s stock price will usually decrease. On the other hand, when they beat estimates, the share price will probably rise. Quarterly profit figures results help investors evaluate a business, i.e., determine whether it can achieve successful long-term profitability. 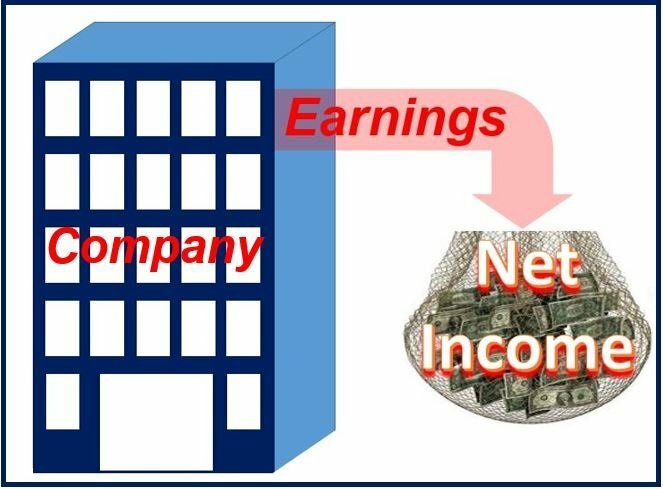 ‘Earnings’ is a general term that describes a business’ net income. In some cases, low or negative income do not necessarily point to a bad stock. For example, a young company may report negative income as it attempts to grow rapidly enough to capture a new market. Investors accept this initial situation because if the business achieves its aim, it will eventually become much more profitable. – EBITDA, which stands for earnings before, taxes, depreciation, and amortization. Analysts use EBITDA to analyze and compare profitability between companies and industries, given that it eliminates the effects of accounting decisions and financing. – Earnings per share. This is the net profit divided by the total number of shares. The term may also refer to the salary/wages of an employee. If a company’s management focuses too much on profits, they could be contributing towards its eventual death. Spending on research and development may initially reduce net income. However, it eventually brings new and exciting products. A growing number of experts today comment that the current obsession with trying to get maximum quarterly profits undermines companies’ futures.